Many bloggers write because they love to write. Others blog to make money. And some want to do both. ECommerce doesn’t have to be nerve-wracking or stressful. There are some extremely easy and affordable options for selling, without hiring a developer. Regardless of your WordPress skills, there is an eCommerce option that is safe, secure, and easy to set up. As a blogger you’re focused on building a community of followers who are interested in what you have to say. This is an instant niche market for selling your unique products. With the right approach, you can easily leverage your existing audience and create a new profit stream for your blog. 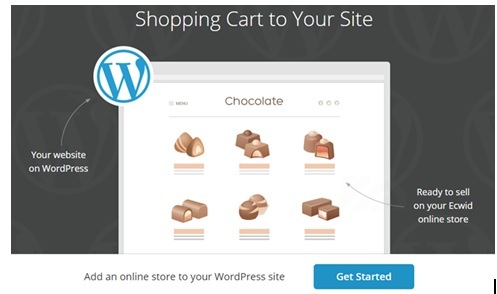 There is a huge range of WordPress shopping cart or buy button plugins. The options are endless, and there’s a big learning curve. Some work better for physical products, and others are best for digital. If you’ve not familiar with eCommerce, here’s a few tips to keep in mind when choosing an eCommerce solution. Check how easy it is to setup. Some are hosted on your server, and some are hosted for you. For example, WooCommerce is hosted on your server, while a solution like Shopify or Selz is hosted for you. You never know when you’re going to need it, so check out the free support options. There is nothing more frustrating than spending precious time hunting around forums, rather than being helped directly. Site security is essential. Your customers must trust your sales process, or they’ll never buy. Check if you will need to get a SSL certificate for your site, and check that the plugin/solution is PCI compliant (which is required if handling payments). Site speed is often overlooked, but potential customers are very sensitive to page loading times. Statistics show 57% of customers will abandon a web page if it takes more than 3 seconds to load. So make sure that your pages aren’t slowed down by any plugins or shopping carts. A streamlined checkout process is easy, simple and quick. Try using a system before you choose an eCommerce option. Avoid eCommerce systems that transfer customers away from your site, and don’t choose an option that asks them to register before buying. Mobile ecommerce will account for 30% of global ecommerce sales by 2018, and 52% of tablet users prefer to shop using a tablet. Make sure the option you choose has a great mobile option. If you only have a few items to sell, you can integrate an eCommerce option directly into your blog. Woo Commerce is a popular choice for physical and digital items. WooCommerce has a bit of a learning curve to ensure it’s working correctly. It’s free to use, but you’ll need $80 extensions if you want something more than a basic PayPal checkout. Selz is newer, and is remarkably easy and quick to set up on your site. A quick copy and paste and you’re done. Selz hosts everything, including the entire checkout process. You can use Selz for services, physical and digital products. It has loads of useful features, including video streaming and downloads to Kindle and Dropbox. It’s free to set up, and they charge a small fee per sale. In fact, you can test it for free if giving away your products like a free ebook for newsletter registration. 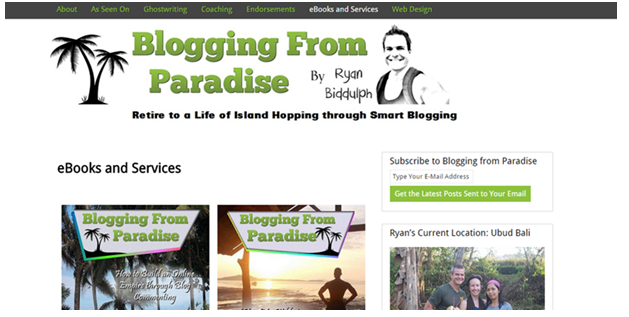 A great example of a blogger who understands how to leverage his blog is Ryan Biddulph, from Blogging from Paradise. He sells his popular books directly from his WordPress website using a Selz plugin. He’s created products that tie into his blog’s theme, Retire to a Life of Island Hopping through Smart Blogging. If you have several products to sell, you can embed a simple online store within a page on your blog. You can do this using ECWID or Selz. They both host products, checkout, and store digital products for you. They are responsible for security, payments, and delivery of each digital sale. ECWID charges a monthly fee if selling more than 10 products, plus payment processor costs. It doesn’t have themes to choose from, but it’s easy to use and you don’t need any special coding skills. Another option is to create a hosted online store and link it to your blog. 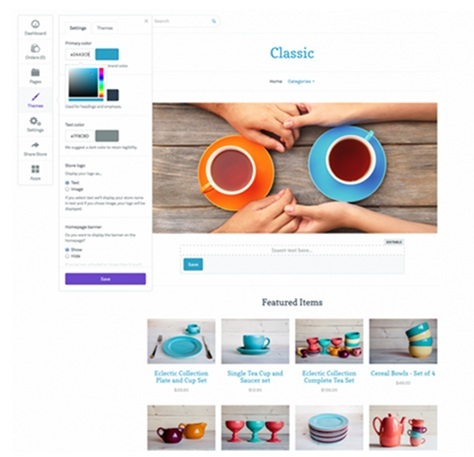 With Selz, you create an online store with customizable pages for $9.99 a month. Shopify or BigCommerce are other popular hosted ecommerce websites. Prices start at $29 a month, plus transaction fees per sale. Make use of the free trials available to see which is easier and best suited to your needs. Once you’ve chosen your store theme, added your products, you can then add a link “Store” to your blog’s navigation. The advantages of creating this type of online store is it’s secure, optimized for speed and will maximize sales. You Can Profit from Your Blog! You’re writing and growing your audience every day. Between social media and blogging, you’ve got your own tribe. Your blogs audience is the perfect niche market to sell your unique products. Of course you shouldn’t turn your blog into a sales page, as your readers will run away in horror. Sean Wes in his podcast shows how to market your products and services without feeling awkward. Remember, your audience already loves your blog. They’re just waiting to buy your unique products. Grab Your Free E-book Now & Get Traffic Hacks !!! Be sure to subscribe to the Bloggersideas newsletter and get regular updates. Take your website traffic and conversions off the charts ! You will also receive Worth 50$ FREE 5000+ SEO Word guide ! This guide will give you detailed insights on how actually SEO works ! I Promise No Spam !!! Thanks for writing such informative article on Jitendra’s blog. Selling items through site is a great way to start online career. You made this process more easy by mentioning all steps so nicely. Thanks for your big contribution. Overall, pretty awesome and thanks for sharing! Can WordPress be used to promote Click Bank affiliate products? If so, do you have any pointers or insight into how to get it started? I have a CB account but not set up with WordPress yet.